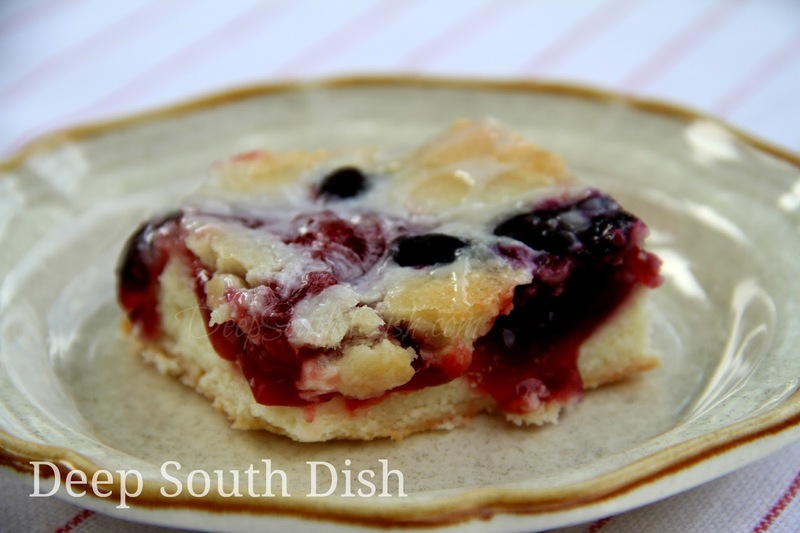 A cookie bar made with cherry pie filling and blueberries and drizzled with a powdered sugar glaze. 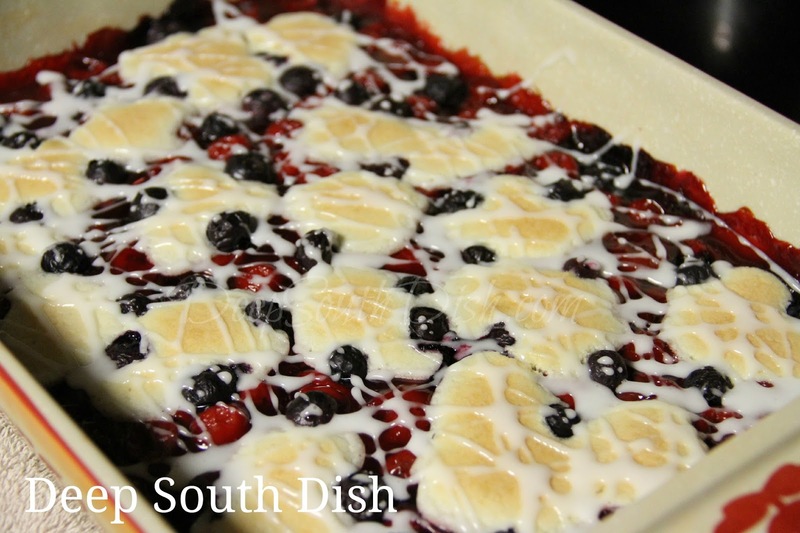 This is another one of those recipes that kept passing by on my personal Facebook timeline so much that I decided to make it for our Memorial Day celebration with my son and daughter-in-law. 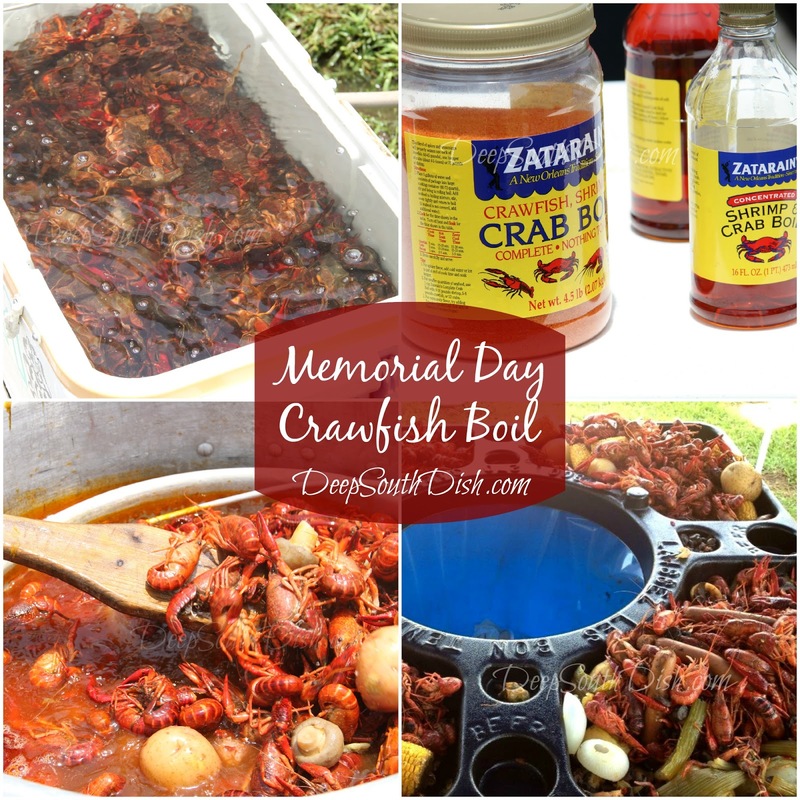 Since that holiday is the unofficial beginning of summer and falls right in the midst of crawfish season, they host a crawfish boil every year, along with the usual hot dogs and burgers. One of my son's closest friends, Brad, is the master crawfish cook, so he always handles the cooking of the crawfish and does an excellent job of it. They sure were good this year! The boil has become a bit of an annual tradition for them and we look forward to it every year, though it was so hot that day, that The Cajun and I didn't stick around too long. I adapted the bar recipe that's been passed around to my own liking, of course, and loved the results. While I had exited the party before the dessert dive, I wasn't sure how well they were received, but I've gotten some positive feedback since and I think they would make a great addition to any patriotic cookout... such as 4th of July which incidentally, in case you hadn't noticed, is right around the corner already. Geez Louise! Anyway,, here's how to make them. For the full recipe with measurements and a printable document, scroll on down the page a bit and you'll see it, right pass all the yakkin' henceforth comin' up. Preheat the oven to 350 degrees F and butter a 9 x 13 inch baking dish; set aside. Using a mixer, cream together butter and sugar, mixing in the eggs and extract. Add the flour, 1/2 cup at a time, along with a pinch of salt. Mixing until fully incorporated. Spread 2/3rds of the mixture in the bottom of the prepared pan. It will be a thin layer. This is a great place to add in a cream cheese filling if you want a more danish like bar. Check that out in the cook's notes of the recipe! Spread the pie filling on top. Top with dollops of the remaining batter. There ya go - red, white and blue. And most important, easy. Bake at 350 degrees F for about 45 to 55 minutes, or until topping is lightly browned. Remove to a cooling rack and allow to fully cool. Prepare glaze by adding 1 teaspoon of milk to the powdered sugar. Stir well and add additional milk a few drops at a time until desired consistency is reached. If you accidentally add too much and get it too thin, just add more powdered sugar. Drizzle over the top of the cooled bars. Cut into squares to serve. Preheat oven to 350 degrees F. Butter a 9 x 13 inch baking dish; set aside. Cream together butter and sugar. Mix in eggs and extract. Add flour, 1/2 cup at a time, along with a pinch of salt, mixing until fully incorporated. Spread 2/3rds of the mixture in the bottom of the prepared pan. Spread the pie filling on top, scatter blueberries all over and top with dollops of the remaining batter. Bake at 350 for about 45 to 55 minutes, or until topping is lightly brown. Remove to a cooling rack and allow to fully cool. Prepare glaze by adding 1 teaspoon of milk to the powdered sugar. Stir well and add additional milk a few drops at a time until desired consistency is reached. Drizzle over the top of the cooled bars. Cherry Danish Bars: Combine 1 (8 ounce) block of cream cheese, softened at room temperature, with one large egg, and 1/4 cup of sugar. Spread on the dough before adding the pie filling. Proceed as above. Cook's Notes: Change out the pie filling for variety, adapting or omitting fresh fruit as needed. A must try for me!! I wonder, though, if a bit of lemon in the glaze would work. (I put lemon juice & zest in my blueberry pie.) Love your recipes, Mary! So glad you used almond extract, that's perfect with cherries. I need to make more desserts. The crust looks so good. I will have to bake this for my family. My hubby and I love cherries. I hope you enjoy the bars Joanne! Thank you so much for this recipe. I ran out to the store on the morning of July 4th and picked up cherry pie filling and blueberries to go with the fresh cherries I already had. I did add about a ¼ cup of buttermilk to the dough because I just didn’t think I had enough dough to spread. I ended up with a delicious cherry cobbler. The dough was like cake and just delicious! Oh, it was so darn good. I will be making this dessert again. You're so welcome - I'll have to try that too! You're welcome Lori & thanks so much for letting me know y'all enjoyed it!! I'd love this! I know it's getting to be fresh cherry season but one of my guilty pleasures is cherry pie filling for cobblers. Made this for a Memorial Weekend Cookout, 2015 and it was awesome. Easy-to-follow directions and very tasty. There were no leftovers! Thanks for letting me know Constance - I'm so glad everybody enjoyed them! Made these last night and they are delicious!!! I want to try them with Blackberries next time. Very yummy!! Thank you for all the great recipes! You're so welcome Audrey & thanks so much for taking the time to come back and let me know you enjoyed them! !